A product of the Accoyo Durazno and Accoyo Bruxo Lines, his credentials could not be any stronger. With a glossy, twisting lock reaching tothe skin, Helios is a dominant force int he colored suri market. The colors of his offspring have ranged from white to fawn to black and silver grey. One of his foirst offspring, Silver Belle, was the highest lot in the AOBA 2002 auction. He has oproduced many champions including, Accoyo America Co\chise, Pacific Crest Honeysuckle, Accoyo America Helix. 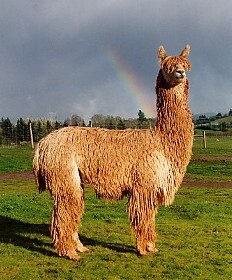 Helios is a vigorous breeder, even at the age of 14 and has sired over 70 cria. 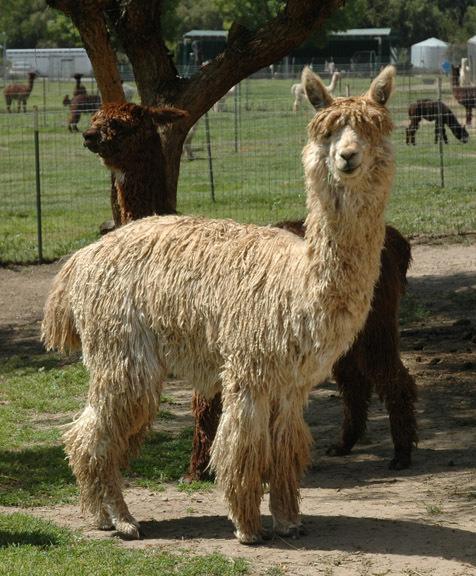 We are proud to co-own this awesome male with Eagle Valley Alpacas and Green Valley Alpacas. Helios is closed to outside breedings but we can offer several of our females bred to him for a 2012 cria or potential for a breeding for a purchased Double D Alpaca female. Inquire about the details. 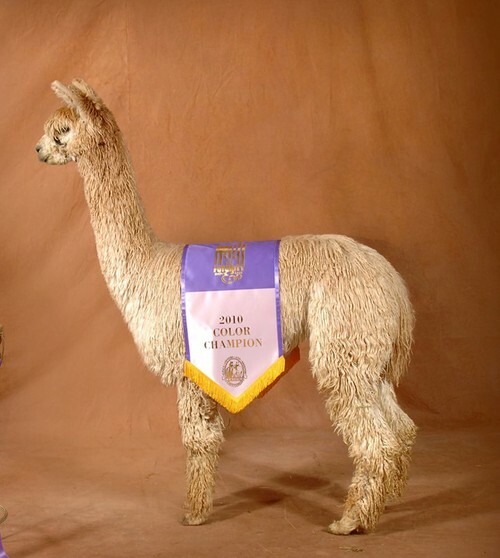 SIERRA BONITA'S MACCOYO MAXIMUM (MAX): In 2010 Max took the Color Championship at The Futurity as the only shorn animal that had taken a Championship when judged with Full Fleece animals. He has been said to be the Total Suri Male by 7 Judges. Accoyo America Encantadora came to us as a bit of a fluke. I was at Pacific Crest's auction with a friend, not intending to buy anything (come on, you have probably been in that same situation!) when Encantadora came on the stage. We had bought NGG Accoyo Apache II the year before, and Encantadora was not related to him. She was also stunningly beautiful, a Helios daughter, and had an adorable face. AND she was going to for far too little. So I threw in a bid, expecting it to jump start the bidding, and .....it STOPPED!! So she was mine, and we've always been glad. This year Encantadora was bred to APEX Bracito's Fromage, the newest member of our herdsire lineup. Fromage brings tremendous bone and stature, as well as dense, consistent, lustrous fleece to the equation. 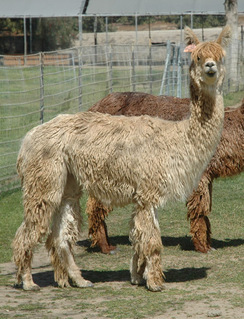 The cria is a lovely white male who was 21 lbs at birth. He hasn't slowed down yet! Why are we selling Encantadora? Well, you have to sell somebody...... not happy about it, but you will be! She is the perfect foundation female. She gets pregnant easily, takes great care of her babies with lots of milk, and consistently turns out crias that we want to breed ourselves. She will do amazing things for your herd!